Acute kidney injury (AKI) is an important and common complication of cardiac surgery and has reported rates of 8.9%–45.8%.1–4 AKI independently increases the length and cost of hospitalization5 and is also associated with higher in-hospital mortality and poor long-term survival.6,7 Therefore, a number of studies have focused on preoperative therapies to prevent cardiac surgery-associated acute kidney injury (CSA-AKI). Statins, with pleiotropic antiinflammatory and antioxidant effects, have been considered to reduce the risk of CSA-AKI, which is related to inflammation and oxidative stress.8,9 Wang et al10 systematically reviewed 21 observational studies and 5 randomized controlled trials (RCTs) and found that preoperative statin treatment reduced the incidence of short- and long-term renal dysfunction after surgery. However, they mainly included observational studies, in which the results could be influenced by confounding factors. A recent meta-analysis of 10 RCTs showed that perioperative statin therapy did not reduce CSA-AKI, and in contrast, appeared to produce unfavorable outcomes.11 However, this study combined the effects of dialysis and CSA-AKI, which could influence the conclusions. In addition, whether different statins type (atorvastatin or rosuvastatin) or administration time (pre and post operation) had different effects on CSA-AKI was not elucidated. Therefore, the present updated meta-analysis included studies of the incidence of CSA-AKI only and performed subgroup analyses to better demonstrate the efficacy of perioperative statins for the prevention of CSA-AKI. A systematic search of PubMed, ClinicalTrials.gov, Web of Science, Embase, Medline, and the Cochrane Library was performed from inception to July 2016 using the following terms: (surgery or cardiac surgery or coronary artery bypass surgery or heart surgery or valve surgery) AND (statin or atorvastatin or rosuvastatin or simvastatin) AND (renal failure or acute renal failure or acute kidney failure or ARF or renal insufficiency or acute renal insufficiency or acute kidney insufficiency or renal dysfunction or acute kidney injury or AKI or acute tubular necrosis or ATN). RCTs comparing statin versus placebo for preventing AKI after cardiac surgery were selected. Potentially suitable studies were also obtained from references of the included papers and meta-analyses. Furthermore, related abstracts with complete results sections from the American Heart Association, the American College of Cardiology, the European Society of Cardiology, and the American Society of Nephrology were included in this analysis. The language was restricted to English. Eligible articles were independently identified through their titles and abstracts by two reviewers. If unidentified, the full text of the paper was carefully reviewed for inclusion. Any controversies were discussed with a third reviewer. 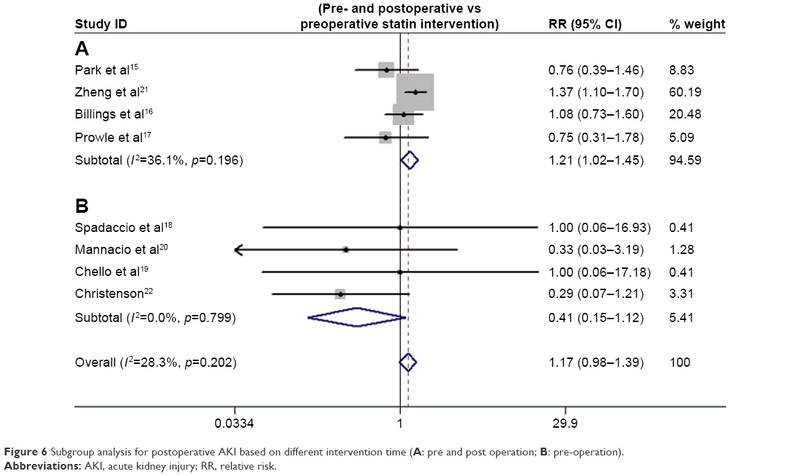 RCTs comparing perioperative statin versus placebo in preventing CSA-AKI were included. The following exclusion criteria were used: 1) duplicate papers, 2) non-RCTs, 3) preclinical (in vitro or animal) studies, and 4) studies lacking data about occurrence of CSA-AKI. Methodological quality was evaluated using the JADAD scoring system12 by two independent reviewers and disagreements were resolved by a third one. The primary outcome was CSA-AKI. 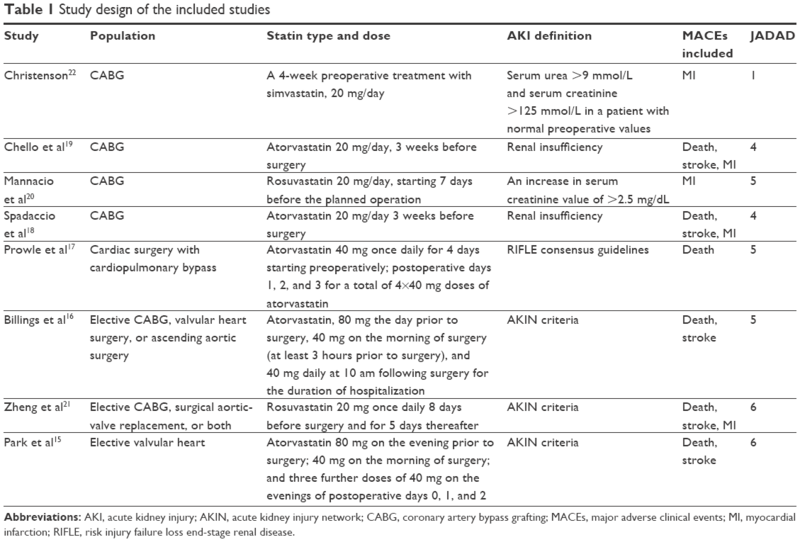 We accepted the definition of CSA-AKI in each included study, including the risk, injury, failure, loss, end-stage renal disease (RIFLE),13 acute kidney injury network (AKIN),14 and other criteria. The secondary outcome was major adverse clinical events (MACEs) including death or stroke or myocardial infarction. The period of enrollment, first author, number of patients, mean age, proportion of females, baseline creatinine, statin dosing regimen, definition of CSA-AKI, incidence of CSA-AKI, and mortality in each group were extracted from enrolled papers. The pooled relative risks (RR) with 95% CIs were calculated to assess the effect of perioperative statin in preventing CSA-AKI or MACEs after cardiac surgery. Funnel plots were displayed to subjectively assess publication bias. In addition, Egger’s and Begg’s tests were used to quantify the bias of publication. Heterogeneity was assessed by I-squared statistics. I-squared values <25% were regarded as low heterogeneity, 25%–50% as moderate, and >50% as severe. A fixed-effect model was performed in the absence of significant heterogeneity, defined as a p-value >0.10 and I2<50%. On the contrary, random-effects model was used (p-value ≤0.10 or I2≤50%). Several subgroup analyses were also conducted to identify potential differences in treatment across the trials. Subgroup analyses were performed according to different study protocols (definition of CSA-AKI, sample size, or population) and different types of statins (atorvastatin or rosuvastatin) or their administration time. A p-value <0.05 in a two-tailed test was considered statistically significant. Statistical analyses were performed using STATA version 12.0 (Stata Corp, College Station, TX, USA). There were 605 articles screened according to the search strategy, and 84 relevant papers addressed the incidence of CSA-AKI. Finally, eight RCTs were included according to the inclusion and exclusion criteria (Figure 1). The detailed characteristics are described in Table 1. Figure 1 Flowchart of study selection. Abbreviation: RCTs, randomized controlled trials. Abbreviations: AKI, acute kidney injury; AKIN, acute kidney injury network; CABG, coronary artery bypass grafting; MACEs, major adverse clinical events; MI, myocardial infarction; RIFLE, risk injury failure loss end-stage renal disease. All the identified studies were evaluated by modified JADAD scores and had high technical quality. These studies were not symmetrically distributed in the funnel plots (Figure 2). There was significant publication bias according to Egger’s test (bias =2.97, p=0.025). Moderate heterogeneity occurred in these studies (I-squared =28.3%; p=0.202). The fixed-effect model indicated that perioperative statin treatment did not significantly reduce incidence of CSA-AKI (RR =1.17, 95% CI: 0.98–1.39, p=0.076, Figure 3). In addition, statin therapy did not reduce the incidence of MACE (RR =1.01, 95% CI: 0.72–1.43, p=0.942, Figure 4), with low heterogeneity (I-squared =20.2%; p=0.281). 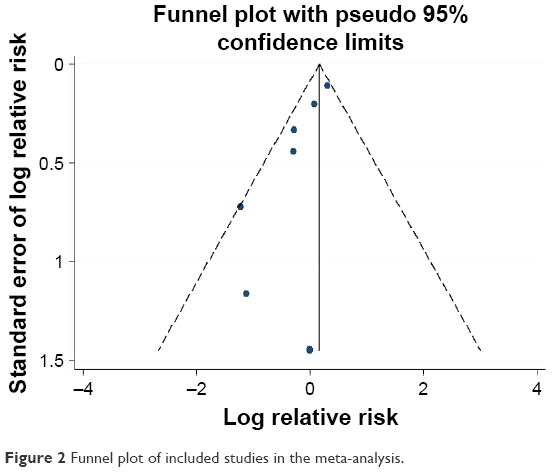 Figure 2 Funnel plot of included studies in the meta-analysis. Figure 3 Forest plot of RR and 95% CI for postoperative AKI. Abbreviations: AKI, acute kidney injury; RR, relative risk. 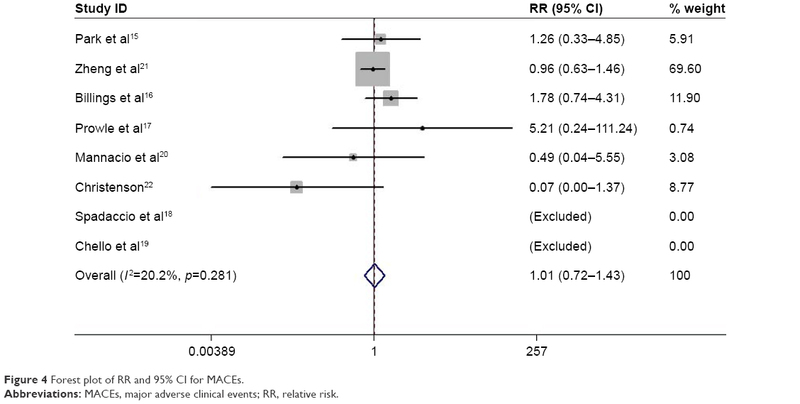 Figure 4 Forest plot of RR and 95% CI for MACEs. Abbreviations: MACEs, major adverse clinical events; RR, relative risk. Four studies had a clear definition of CSA-AKI based on RIFLE or AKIN. The pooled estimate demonstrated that perioperative statin therapy significantly increased the risk of CSA-AKI (I-squared =36.1%, RR =1.21, 95% CI: 1.02–1.45, p=0.032). The analysis based on different sample size showed that statin therapy was associated with a higher incidence of CSA-AKI in studies with a sample size >50015,16,21 (I-squared =5.6%, RR =1.29, 95% CI: 1.07–1.57, p=0.008), but no statistical difference in studies with a sample size <500 (I-squared =0%, RR =0.66, 95% CI: 0.41–1.04, p=0.074). Studies with a JADAD score >3 showed that perioperative statin was related to a higher risk of CSA-AKI (I-squared =0%, RR =1.20, 95% CI: 1.01–1.43, p=0.042).15–21 In addition, statin treatment did not significantly reduce the incidence of CSA-AKI in patients undergoing isolated CABG (I-squared =0%, RR =0.41, 95% CI: 0.15–1.12, p=0.081). 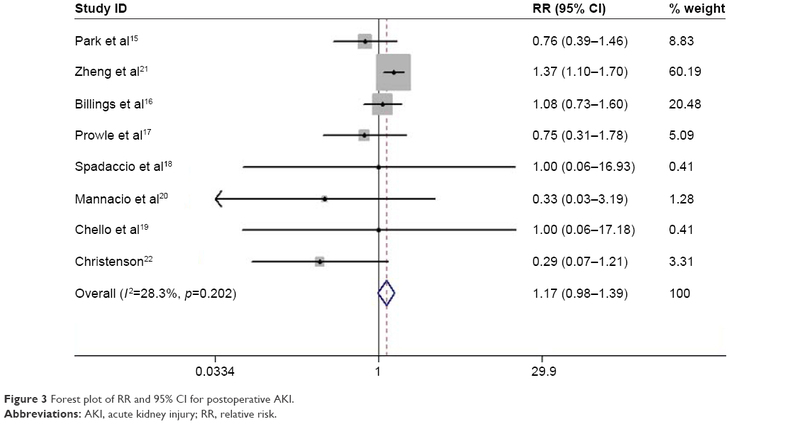 Furthermore, perioperative rosuvastatin therapy produced slightly significantly higher risks of AKI than atorvastatin therapy (p=0.070, Figure 5). The effects of different intervention times were also evaluated, and the results showed that statin treatment both pre and post operation was associated with higher risk of CSA-AKI than preoperative statin therapy alone (p=0.040, Figure 6). Due to the greater statistical weight of the study performed by Zheng et al,21 we also performed a subgroup analysis without this study, and the results showed that statin treatment did not significantly reduce the incidence of CSA-AKI (I-squared =0%, RR =0.74, 95% CI: 0.49–1.12, p=0.161). Figure 5 Subgroup analysis for postoperative AKI based on different interventions (A: atorvastatin; B: rosuvastatin). Figure 6 Subgroup analysis for postoperative AKI based on different intervention time (A: pre and post operation; B: pre-operation). 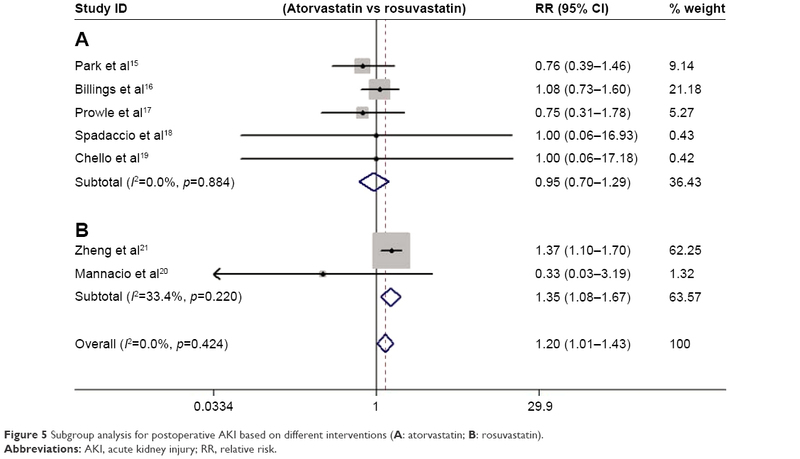 This meta-analysis demonstrated that perioperative statin therapy might in fact increase the risk of CSA-AKI, which was in accordance with the recent research by Putzu et al.11 However, we also demonstrated that rosuvastatin showed a tendency to increase the risk of CSA-AKI more than atorvastatin. In addition, compared with preoperative statin therapy, statin therapy both pre- and postoperatively seemed to have a higher risk of CSA-AKI. Recently, Li et al23 included these three RCTs and reported that patients undergoing cardiac surgery might benefit from statins by reducing CSA-AKI and the mortality of the patients suffering from CSA-AKI. However, our results showed that perioperative statin therapy did not reduce CSA-AKI, and in contrast, appeared to produce an unfavorable influence. This finding was not in accordance with previous meta-analyses.10,23 Some differences could account for this phenomenon. In the meta-analysis conducted by Wang et al,10 most of the included research was observational studies, in which confounding factors could impact the reported effects of statins on CSA-AKI. Also, the meta-analysis of Li et al23 combined observational and randomized studies, which could increase heterogeneity. Although a recent meta-analysis11 reported results similar to ours, they also included two studies with incident dialysis but not CSA-AKI24,25 which were excluded in our analysis. There are several possible explanations for our finding that statins had no protective effect against CAS-AKI. First, cardiac surgery was commonly accompanied by ischemic injury, and resultant liver and renal dysfunction.26,27 Statins, which are mainly metabolized by the liver and kidney, might aggravate the stress on these organs and increase the incidence of CSA-AKI. Second, although statins may exert favorable effects on contrast-induced AKI via antiinflammatory and antioxidant actions,28,29 this was not shown to have benefits on CSA-AKI. Different degrees of antiinflammatory actions could account for this discrepancy. Notable systemic oxidative stress and inflammation would be expected in patients undergoing cardiac surgery,30 and this may not be inhibited significantly by statin therapy.15 Lastly, Allou et al31 reported that the positive effect of statin on CSA-AKI was seen only in patients with high cardiovascular risk. The four initial studies18–20,22 that included only patients undergoing CABG showed that statin therapy seemed to protect against CSA-AKI (RR =0.41, p=0.081). The later studies15–17,21 with relatively larger sample sizes did not focus on these population, so protective effects were not documented. Therefore, whether the effects of statins on CSA-AKI are influenced by operative types was unclear. Subgroup analysis of the different administration times indicated that statin intervention during the entire perioperative period slightly increased the risk of CSA-AKI relative to preoperative statin therapy alone. However, preoperative statin therapy was performed only in the initial studies,18–20,22 which included patients with high cardiovascular risk. The inconsistent definitions of CSA-AKI and small sample sizes may affect the result. Unfortunately, the later studies did not continue this research design. Therefore, the value of statin administration times on the risk of CSA-AKI was not confirmed. Some limitations should be considered when applying the findings of this study. First, the inherent weakness of meta-analysis, in which publication bias and data from different or variable protocols are combined, might impact the results. Second, CSA-AKI might be considered a secondary endpoint in the included research studies, which could lead to miss some potentially relevant studies. However, we also included studies from previously published reviews. Third, the dose-dependent effects of statins on CSA-AKI are not fully understood because of the restrictions of the meta-analysis. Finally, although we performed subgroup analyses of different definitions of CSA-AKI, non-standardized definitions might influence the results. Therefore, the roles of statins (different types or administration times) in preventing CSA-AKI in patients with or without high cardiovascular risk remain to be clarified by further high-quality RCTs. Perioperative statin therapy did not reduce the incidence of CSA-AKI, and in contrast, may exert unfavorable effects on renal function. Rosuvastatin showed a tendency of increasing risk of CSA-AKI compared with atorvastatin. In addition, compared with preoperative statin therapy, statin therapy throughout the perioperative period seemed to confer a higher risk of CSA-AKI. Parolari A, Pesce LL, Pacini D, et al; Monzino Research Group on Cardiac Surgery Outcomes. Risk factors for perioperative acute kidney injury after adult cardiac surgery: Role of perioperative management. Ann Thorac Surg. 2012;93(2):584–591. Karkouti K, Wijeysundera DN, Yau TM, et al. Acute kidney injury after cardiac surgery: focus on modifiable risk factors. Circulation. 2009;119(4):495–502. Haase M, Bellomo R, Matalanis G, Calzavacca P, Dragun D, Haase-Fielitz A. A comparison of the RIFLE and Acute Kidney Injury Network classifications for cardiac surgery-associated acute kidney injury: A prospective cohort study. J Thorac Cardiovasc Surg. 2009;138(6):1370–1376. Bagur R, Webb JG, Nietlispach F, et al. Acute kidney injury following transcatheter aortic valve implantation: predictive factors, prognostic value, and comparison with surgical aortic valve replacement. Eur Heart J. 2010;31(7):865–874. Li SY, Chen JY, Yang WC, Chuang CL. Acute kidney injury network classification predicts in-hospital and long-term mortality in patients undergoing elective coronary artery bypass grafting surgery. Eur J Cardiothorac Surg. 2011;39(3):323–328. Bihorac A, Yavas S, Subbiah S, et al. Long-term risk of mortality and acute kidney injury during hospitalization after major surgery. Ann Surg. 2009;249(5):851–858. Thiele RH, Isbell JM, Rosner MH. AKI associated with cardiac surgery. Clin J Am Soc Nephrol. 2015;10(3):500–514. Pinho-Gomes AC, Reilly S, Brandes RP, Casadei B. Targeting inflammation and oxidative stress in atrial fibrillation: Role of 3-hydroxy-3-methylglutaryl-coenzyme a reductase inhibition with statins. Antioxid Redox Signal. 2014;20(8):1268–1285. Wang J, Gu C, Gao M, Yu W, Yu Y. Preoperative statin therapy and renal outcomes after cardiac surgery: a meta-analysis and meta-regression of 59,771 patients. Can J Cardiol. 2015;31(8):1051–1060. Putzu A, Capelli B, Belletti A, et al. Perioperative statin therapy in cardiac surgery: A meta-analysis of randomized controlled trials. Crit Care. 2016;20(1):395. Jadad AR, Moore RA, Carroll D, et al. Assessing the quality of reports of randomized clinical trials: Is blinding necessary? Control Clin Trials. 1996;17(1):1–12. Bellomo R, Ronco C, Kellum JA, Mehta RL, Palevsky P. Acute renal failure – definition, outcome measures, animal models, fluid therapy and information technology needs: The Second International Consensus Conference of the Acute Dialysis Quality Initiative (ADQI) Group. Crit Care. 2004;8(4):R204–R212. Mehta RL, Kellum JA, Shah SV, et al. Acute Kidney Injury Network: report of an initiative to improve outcomes in acute kidney injury. Crit Care. 2007;11(2):R31. Park JH, Shim JK, Song JW, Soh S, Kwak YL. Effect of atorvastatin on the incidence of acute kidney injury following valvular heart surgery: a randomized, placebo-controlled trial. Intensive Care Med. 2016;42(9):1398–1407. Billings FT, Hendricks PA, Schildcrout JS, et al. High-dose perioperative atorvastatin and acute kidney injury following cardiac surgery: a randomized clinical trial. JAMA. 2016;315(9):877–888. Prowle JR, Calzavacca P, Licari E, et al. Pilot double-blind, randomized controlled trial of short-term atorvastatin for prevention of acute kidney injury after cardiac surgery. Nephrology (Carlton). 2012;17(3):215–224. Spadaccio C, Pollari F, Casacalenda A, et al. Atorvastatin increases the number of endothelial progenitor cells after cardiac surgery: a randomized control study. J Cardiovasc Pharmacol. 2010;55(1):30–38. Chello M, Patti G, Candura D, et al. Effects of atorvastatin on systemic inflammatory response after coronary bypass surgery. Crit Care Med. 2006;34(3):660–667. Mannacio VA, Iorio D, De Amicis V, Di Lello F, Musumeci F. Effect of rosuvastatin pretreatment on myocardial damage after coronary surgery: a randomized trial. J Thorac Cardiovasc Surg. 2008;136(6):1541–1548. Zheng Z, Jayaram R, Jiang L, et al. Perioperative rosuvastatin in cardiac surgery. N Engl J Med. 2016;374:1744–1753. Christenson JT. Preoperative lipid-control with simvastatin reduces the risk of postoperative thrombocytosis and thrombotic complications following CABG. Eur J Cardiothorac Surg. 1999;15(4):394–399. Li M, Zou H, Xu G. The prevention of statins against AKI and mortality following cardiac surgery: a meta-analysis. Int J Cardiol. 2016;222:260–266. Baran C, Durdu S, Dalva K, et al. Effects of preoperative short term use of atorvastatin on endothelial progenitor cells after coronary surgery: a randomized, controlled trial. Stem Cell Rev. 2012;8(3):963–971. Carrascal Y, Arnold RJ, De la Fuente L, et al. Efficacy of atorvastatin in prevention of atrial fibrillation after heart valve surgery in the PROFACE trial (PROphylaxis of postoperative atrial Fibrillation After Cardiac surgEry). J Arrhythm. 2016;32(3):191–197. Raman JS, Kochi K, Morimatsu H, Buxton B, Bellomo R. Severe ischemic early liver injury after cardiac surgery. Ann Thorac Surg. 2002;74(5):1601–1606. O’Neal JB, Shaw AD, Billings FT. Acute kidney injury following cardiac surgery: current understanding and future directions. Crit Care. 2016;20(1):187. Marenzi G, Cosentino N, Werba JP, Tedesco CC, Veglia F, Bartorelli AL. A meta-analysis of randomized controlled trials on statins for the prevention of contrast-induced acute kidney injury in patients with and without acute coronary syndromes. Int J Cardiol. 2015;183:47–53. Liu YH, Liu Y, Duan CY, et al. 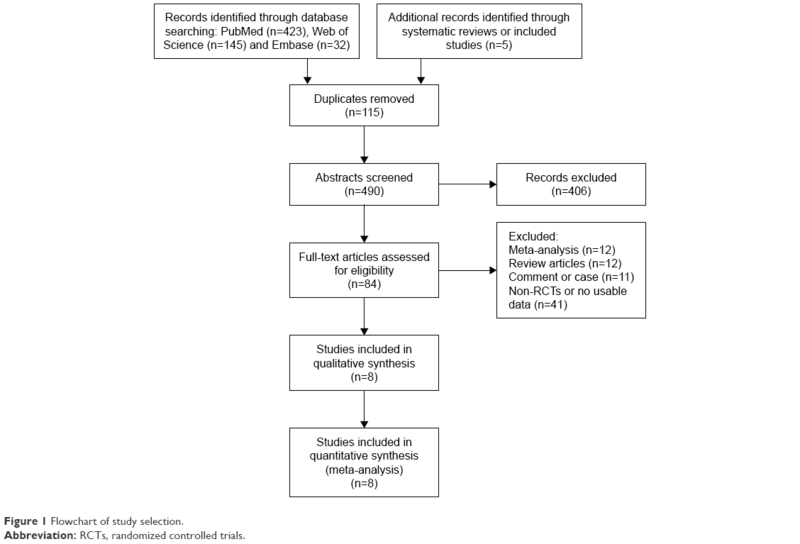 Statins for the prevention of contrast-induced nephropathy after coronary angiography/percutaneous interventions: a meta-analysis of randomized controlled trials. J Cardiovasc Pharmacol Ther. 2015;20(2):181–192. Cremer J, Martin M, Redl H, et al. Systemic inflammatory response syndrome after cardiac operations. Ann Thorac Surg. 1996;61(6):1714–1720. Allou N, Augustin P, Dufour G, et al. Preoperative statin treatment is associated with reduced postoperative mortality after isolated cardiac valve surgery in high-risk patients. J Cardiothorac Vasc Anesth. 2010;24(6):921–926. Qu HY, Xiao YW, Jiang GH, Wang ZY, Zhang Y, Zhang M. Effect of atorvastatin versus rosuvastatin on levels of serum lipids, inflammatory markers and adiponectin in patients with hypercholesterolemia. Pharm Res. 2009;26(4):958–964. Ridker PM, Danielson E, Fonseca FA, et al; JUPITER Study Group. Rosuvastatin to prevent vascular events in men and women with elevated C-reactive protein. N Engl J Med. 2008;359(21):2195–2207. Savarese G, Musella F, Volpe M, Paneni F, Perrone-Filardi P. Effects of atorvastatin and rosuvastatin on renal function: a meta-analysis. Int J Cardiol. 2013;167(6):2482–2489. Toth PP, Dayspring TD. Drug safety evaluation of rosuvastatin. Expert Opin Drug Saf. 2011;10(6):969–986. Lennernäs H. Clinical pharmacokinetics of atorvastatin. Clin Pharmacokinet. 2003;42(13):1141–1160.